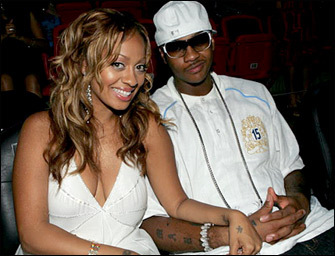 *VH1 cameras are shadowing their own La La Vazquez for a new reality series about her upcoming wedding to Denver Nuggets star Carmelo Anthony, including all the planning and festivities leading up to the big day. The five-part series will premiere on Sunday, Sept. 19 at 10:30 p.m. and consist of four half-hour episodes and a one-hour wedding finale, the network announced. The series opens with La La meeting her A-list wedding planner-to-the-stars Mindy Weiss. Viewers will ride along as La La shops for the perfect designer wedding dress, chooses the wedding venue, picks out the ultimate wedding cake and menu, plans their honeymoon, and contemplates the guest list. Along the way viewers will also get a glimpse at La La’s celeb-hosted bachelorette party in Las Vegas. While planning her fairytale wedding and maintaining her and Carmelo’s hectic schedules, La La works to balance the demands of her career, family, friends, and motherhood. The series will culminate in a one-hour lavish celebrity-filled wedding finale in New York that only this superstar couple could host. VH1’s “La La and Carmelo Anthony” project is executive produced by Cris Abrego for 51 Minds Entertainment, La La Vazquez and Carmelo Anthony for Krossover Entertainment, and Steven Grossman on behalf of The Collective. The series is created by Cris Abrego, La La Vazquez, and Steven Grossman. Next ArticleIs Suicide New Epidemic with BP Oil Leak? Hundred bucks says you watch some of that show. I really honestly plan not to.